I have been keeping chickens for 5 years. Airen, my youngest initially asked to keep chickens after staying with one of her school friends, whose Mum had hatched some chicks. It took me a while to come round and then I had the idea of instead of giving the girls an Easter Egg , I surprised them with a chicken ! They were warren chickens from a local farm, and I instantly fell in love with them. I was lucky enough to purchase a second hand Eglu classic and I have never looked back since. I went on to reorganise the garden to make way for a dedicated larger area for my girls. I purchased the Cube from Omlet, and then had a purpose coop built( 15’ x 25’) for the chickens to run around in. Why Chickens ? They are funny, friendly and they will leave you a present every day. 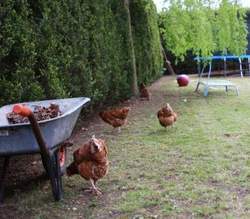 Not only will you never have to buy a supermarket egg again, you will have a free supply of manure for the garden – fantastic for the veggie patch. Chickens are beautiful to look at , and you can spend ages just watching and talking to them. They do actually talk back to you !! When I was looking to find out about Chicken keeping , I could not find a course that was local , and I also wanted to take Airen on the course as well as she was the main instigator of all of this chicken lark – so I thought why not start my own courses and pass on some of the knowledge that I have picked up. I am sure there are a few of you out there with a few questions, so come along and meet my girls and boys , we really look forward to meeting you. A chicken course makes a fantastic present. If you are booking a place for a suprise please let me know and I will send you through a special voucher. This course shows that for beginners, no matter how much reading and research you do, there's no substitute for getting information and tips from someone who has successfully done what you are trying to do. Not to mention the benefits of seeing and holding different hens, and a lovely cup of tea and delicious cakes. All in all, Lisa got the balance just right- enough information to boost our confidence,but not so much that we felt overwhelmed. Thank you! My son and i have just spent a very enjoyable (sunny!) morning with Lisa and her chickens!! I found it difficult to find a chicken keeping course that my 7year old son could attend with me but luckily Lisa was more than happy to accommodate him. Being total novices to anything chicken, we left with a good basic understanding to chicken keeping and feel confident now to order our eglu! Lisa has a wealth of knowledge from her years of keeping chickens and also a very comprehensive shopping list from her own trial and error purchases, which she is happy to share. At the end we chatted over a cup of tea and cake and no question was too silly. We left with a print out of the days topics, together with a shopping list and cleaning schedule. A great morning and highly recommended! Thank you Lisa and chooks!